Philadelphia isn’t only about the Liberty Bell and other key pieces of U.S. history. It’s also the site of a new and innovative approach to airport design and concessions. In October, Philadelphia International (PHL) cut the ribbon on a completely renovated Terminal B and formally marked the end of its $48 million stem-to-stern overhaul. Some project officials describe the new concourse as one giant concessions area with boarding gates sprinkled throughout. Passengers use iPads secured to holdroom seating to order food and beverages, which vendor staff deliver to them gateside. OTG, the airport’s food/beverage provider, invested $32 million in the project, American Airlines paid for the new furniture and PHL funded the rest. American Airlines was also interested in upgrading the terminal where it operates, and soon a conversation ensued about aligning the four organizations’ goals. Together, the four organizations devised a plan to transform the passenger experience at Terminal B. Key components were renovating all concessions and incorporating a more open layout in holdroom areas. American Airlines agreed to replace all holdroom seating and worked with OTG to redevelop the space and lighting. The new gateside areas have an outlet/charging station and iPad at every seat. “Our goal was to create a terminal for the way passengers want to use the airport, not the ways they have been forced to use it in the past,” explains McGinn. The airport created an arrangement with American to pull holdroom space from the carrier’s inventory and place it in MarketPlace’s. OTG, in turn, subleased the space from MarketPlace and lead the redevelopment process. The key, explains McGinn, was to avoid adversely affecting revenues for airline leases and concessions. To achieve that goal, American continued to pay leases even though the airport took some of its holdrooms out of operation. Ultimately, the project was a balancing act between all parties, he explains. Phase I, which includes a “hammerhead” with six gates at the end, is already complete. The rest of the project is scheduled to conclude in August 2018. Airport officials were intent on extending the life of Terminal B with renovations rather than demolishing it and building new facilities. Management was familiar with how OTG had remodeled other airports and wanted to take its efforts even further at PHL. 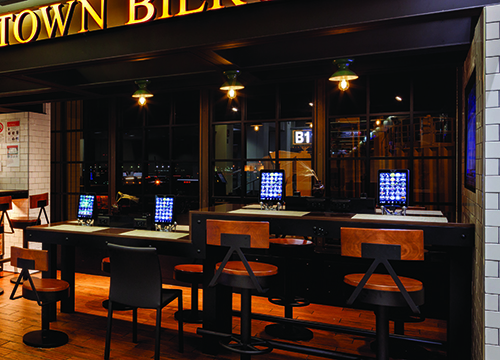 At PHL, the concessions operator installed 1,000 iPads throughout gate lounges and restaurant areas. Travelers use the devices to track their flights, browse the web, play games, and order food and beverages from airport vendors. The new system increases dwell time and passenger enjoyment, reports Tyrrell. Initially, Tyrrell was concerned about implementing an entirely cashless system (the iPads largely require customers to use credit cards to place orders). MarketPlace had managed a smaller, but similar iPad program at Washington National, and found that cashless concessions could, indeed, be a challenge. As a result, PHL installed machines that allow guests to purchase a pre-paid credit card with cash. Alternately, travelers can ask a manager to activate an iPad with cash. Over the last several years, PHL has transformed the airport with capital improvements to the tune of $900 million. During one initiative called “Touch Every Surface,” crews refinished the terrazzo floors and replaced ceiling tiles throughout the 60,000-square-foot facility. The airport also installed a new $8 million heating and air conditioning system and a new roof for $5 million. The recently renovated gate areas feature the work of British lighting designer Tom Dixon, and the project is the largest installation he has ever designed. For natural light with a decorative twist, the airport opted for window mullions—vertical dividers with a 3-foot-by-3-foot pattern instead of the typical 12-inch-by-20-inch configuration used at most airports. It offers a cozier, more home-like feel, explains Tyrrell. The project team also worked to reduce “visual noise” and free up space by removing extraneous trashcans and stanchions. 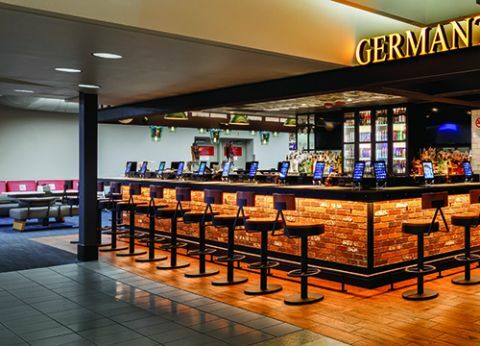 The terminal’s new concessions lineup was designed to connect visitors to the city and surrounding region. OTG added eight local food/beverage operators in 15 different areas—and the menus stretch far beyond Philly cheesesteaks. CIBO Express Gourmet Market, OTG’s award-winning concept that also operates at several other airports, changes its menu seasonally, according to the availability of locally sourced ingredients. The market highlights healthy items such as fresh sushi and organic, gluten-free, vegan, and kosher selections created by local chefs. At Independence Prime, Terminal B’s new steak and chophouse, patrons are seated around an open kitchen and watch chefs prepare their food. Blatstein believes that cooking is a form of entertainment, and points to the current popularity of cooking shows as a testament to the concept. Toward that end, OTG tapped a Top Chef winner, local food truck darling and other notable chefs to up the cuisine in Terminal B. In October, Philadelphia Mayor Jim Kenney cited PHL as an asset that could help the city win Amazon’s second headquarters when he cut the ribbon on the newly renovated Terminal B. In November, the website Eater proclaimed that Terminal B has the best dining options at PHL. American Airlines received an email from one passenger who said she would gladly pay a premium to fly through PHL because of the positive experience she had in Terminal B. While such feedback is music to McGinn’s ears, he notes that PHL’s new gate lounge and concessions strategy may not be right for other airports. As more customers flow through Terminal B, MarketPlace plans to keep an eye on growth and continue to update and improve concessions accordingly.